I recently had the opportunity to test out this line. I was interested in getting the tousled hair of the celebrities out there. I was born with thick, very straight hair and I've always been a fan of curls and big hair. I guess the grass is greener on the other side right? I used to use Herbal Essences all through high school and am familiar with the line. This collection is called "Tousle Me Softly" to give you gorgeous tousled tresses. -First off, the smell is absolutely divine. My BF even noticed and complimented me on it. Herbal Essences has always been good with scents. -However, if you are for sulfate-free products...this isn't for you. -I like how these products are very easily available at major retailers...Wal-Mart, Target you name it. -I started with the shampoo and conditioner. I don't think it's suppose to actually make your hair wavy. Instead, it's supposed to "cleanse and prep" it so you can scrunch with the other products. Like I said, it smelled wonderful and performed like the typical shampoo and conditioner. -Next I tried the Mousse and Spray Gel. This didn't tousle my hair at all with the scrunching method. I tried the spray, scrunch and see method for a few days...but my hair just ended up looking messy. That technique does not work for my straight, thick hair. -The only way I these products would work is if I used them prior to curling my hair in order to keep it in the scrunched, loose wave form. Honestly, that kind of defeats the purpose to me...I can use a curling iron with pretty much regular hair spray and achieve this look. -I might pick up the shampoo and conditioner because of the scent, but probably not the other products. As a result, I decided to let my good friend Melissa give it a go. She has super curly hair and I thought it would work better for her. Note: I tested these products when my hair was damp and I let it air dry. - The fragrance is very pleasing and last longing. It lasts the whole day, night and even the next day. I worked out and there was still hint of it in my hair. - The gel-like product in the jar holds well and does not stiffen the hair too much where it starts to flake or feels like crust. The hardness consistency is just right. I tried the do that manufacturer suggests, the slick back ponytail look, and it held the whole day. - The mousse sprays a good amount of product. I like that it sprays a lot because I have a lot of hair. It holds lightly as it is marketed. It does not leave any crusty or flaky residue. - All products left my hair relatively soft, not hard or crispy like some other products in the market. - I did not like the spray gel because the amount is sprays out is not enough for my amount of hair. I have to do a lot more squirts than the mousse product. -It does not hold as much as the mousse. -It leaves my hair frizzier when it dries up. It does not hold enough for my curly, thick hair, but perhaps for someone who has less curly and thinner hair, it would work better. - The “tossled hair” look did not apply to me due to my kind of hair. When my hair dried, it was curly, not wavy / tossled. But again, for a different kind of hair, I think it would look tossled. Ideally, for my type of hair, I need a stronger hold. I would buy the mousse and gel-like product in the jar again, but I would not buy the spray gel. -It seems like we're both under the ingredient that this product smells great. -However, it seems like this may work better for people with thinner hair or a slight wave. If you're interested in trying these out, check them out at the shampoo aisle of your local drugstore. I've been looking at this product (or maybe a similar one of a different line) as that look is SO in right now and curlers just don't do ANYTHING for my hair and curling iron doesn't either (curls just go flat, not even stay wavy/toussled). Kinda pooped at this review though because I have mega-thick hair and you both have thick hair and said you couldn't get the toussled look. Oh well! Thanks so much for this review though! 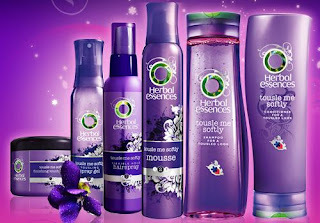 Love the scent of Herbal Essences products! Darn, I have lots of curly hair and wanted to try this. Oh well. At least I won't waste my money now. I have thick curly hair and i could never find anything that worked to curl my hair. this product is great! I use the cream finisher in the jar and what i do is put it all over my hair in the shower(you only need a little bit) and then scrunch my hair with a towel a bit when i get out. Then i use the diffuser while bent upside down to dry my hair. Perfect curls every time Geart product and like everyone else says, it smells AMAZING. I get compliments on how good my hair smells all of the time. I LOVE this product. My hair is about shoulder length, and has natural wave. When I use the shampoo and conditioner oh my hair gets CURLY!I have NOT tried the gel or mousse. What I have done is after I get out of shower i use a little bit of the conditioner and leave it in my hair and let it air dry, scrunching fingers thru it every so often! Soft, sweet smelling curls that can last up to 3 days. I've just used it for the first time - it is meant for naturally wavy hair, which is probably why it didn't work on your straight hair! Naturally wavy/curly hair can go quite flyaway if left to its own devices, but this Tousle Me Softly range keeps it perfectly in check. Love this lots! So no, it won't work if you don't have naturally wavy hair. But then, it does actually say that on the bottle. This is lovely for short hair. I have a pixie cut and everyone always comments on my hair - I even get stopped by people on the street. This product is definitely worth it for the price. It gives hair a natural mussed up look that lasts all day, without frizz, and it doesn't go hard or greasy like other products I've tried.